Please refer to our stock # 1304 when inquiring. 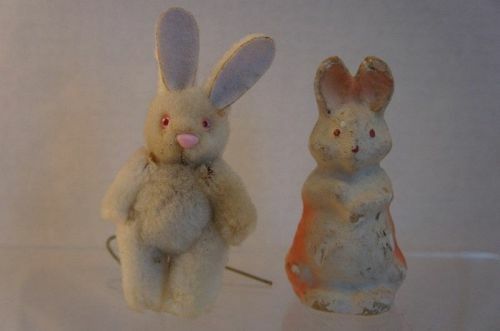 Two antique bunny rabbits, one is a paper mache candy container and the other is a fury rabbit with moveable arms and legs and a wire that may have attached him to a basket or it stabilizes her to stand. They both are a little under 5" tall and show their age a bit. They are both as cute as can be.